Hiking Blogs: Are You Reading One? Good news and bad news about hiking blogs! Both are based on the hard truth about hiking. Bad news first: If you're an avid hiker, you will never have enough time to cross off every "bucket list" hike. (If you're curious about my list, you can check out my Pinterest page). So it's sometimes frustrating to see all of those hikes! Good news: Female hikers who write about their hiking experiences are one way to satisfy an itch to hike EVERYWHERE! What better way to get a glimpse of trails you'll never put your boots on, than through the eyes of a kindred spirit? If I can't put my boots on a trail today, at least let me read about it! Yes, and no, depending on your definition of the word. Yes, because it invites you along virtually on my explorations of hiking trails in North America and Greenland and gives you all of the juicy details. No, because it's a website devoted to diving deeply into the best hiking gear, trail techniques, and hiker safety. That's not a common feature of most hiking blogs, right? 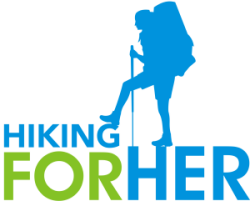 So let's put Hiking For Her into a hybrid category: a blog-site. Most of us would rather be hiking. So reading the adventures of a blogger who hits the trail somewhere in the world that you'd like to visit can be a great way to daydream, muse, gather reconnaissance, or begin to plan a trip. 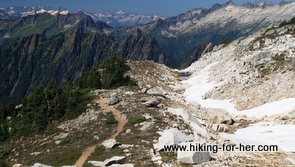 From the blogger's perspective, writing about hiking and backpacking is a huge time commitment. A good blogger devotes time to satisfying audience curiosity on a regular basis, with weekly posts at a bare minimum. Sadly, some of the blogs I've stumbled across aren't updated very often. This is disappointing, because the bloggers are very good at tantalizing me with their adventures. Don't you want to know what happens next?? But the time between posts grows very long, and it's easy to give up and move on to another blog. On the other hand, I understand how precious time is: would I rather hike, or write about it? Another fun feature of a hiking blog: scrolling through photos. Really brings it to life! And I really enjoy the strong dose of reality injected into some of the trail descriptions. Run away from a female blogger who always has perfect hair, endures no mishaps, and is never frustrated or tired. Or dwells excessively on herself, to the exclusion of her readers. Over the course of a few years, I've narrowed down my blog roll to just a few hiking blog favorites. This hiker shares her favorite links, so you can branch out from my admittedly short list to create your own "must read" list. For the latest posts on this website (the "blog" part), go here. Here are a few more tips (and Pacific NW blog suggestions) on how to pick an excellent hiking blog. If you have a moment to let me know which bloggers you follow, and why, I'd be grateful. I'm especially interested in those which are updated frequently, and written by females who are passionate about getting outdoors anywhere on Planet Earth. One more thing: If you're a hiker + writer, please drop me a line. I'd love to take a peek at what you're up to (peaks, waterfalls, long rambles, rocky scrambles, it's all good! ), and maybe feature you in my newsletter. Happy Trails are meant to be shared, right? Just visit my CONTACT page, located at the bottom of the navigation bar at the top left hand side of this page.